Riders will compete In several heats with winners advancing to a championship round. 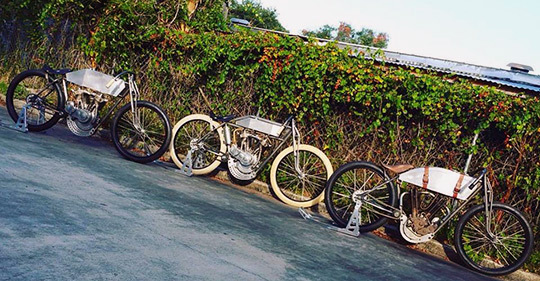 Each racer will sit astride identical hand-built racing chassis holding pre-1925 1,000cc American V-Twin engines,. Most of the 8 racers have customized their machines with fabricated fuel/oil tanks. handlebars, exhaust, fenders and foot pegs. Champion will receive a brand new Shovelhead type S motor donated by S&S Cycle. Ticket options: 1- Special presale pricing for single-day tickets: $15 for adults, $5 for kids until September 1 (hese tickets get you in the gate only on the 15th (after 9/1, single-day presale tickets are $20 per-person) 2- $50 pre-sale gets you VIP access and choice seating, allowing you to watch the practice session on the 14th and attend the race on the 15th. 3- 3- $250ticket pre-sale gets you a 1-hour group tour of Billy’s shop and choice seating for both days. 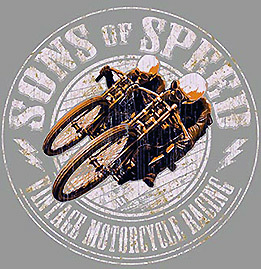 At Sons Of Speed Tickets. Got to watch the board trackers race on the flat track at Davenport a few times at the AMCA meets. Very cool stuff indeed. Would love to be able to see this event as well. It sounded fun when I first heard of it, and it still sounds fun, so I think I will go check this out. COOL…I like Billy’s thinking, work product and character. Kudos to Billy for putting this together. I should be able to attend and will plan to. I’ll be interesting fun! Hey Gym, How about a little forgiveness brother. We can’t take back the mistakes we make in life, and I know I’ve made my share, but we can move forward, and try to make the world a better place. Billy is just trying to get on with his life, and your ‘holier than thou” comment, I have to think, is offensive to most of us in this forum. If you don’t get it, you should try a little introspection, and I know if you look deep enough you’ll find we’re all just human, we make mistakes, we wish things could have been different, but the best thing is to change your life, do positive work, and be a better example. Billy is doing just that, and I’m sure you agree we all deserve a second chance. This will be a great event, and I’m proud to be a supporter! OK, so the interface works…. However, :trying “.. . to make the world a better place…” has gotten WAY out of hand. Le-me suggest we’d all be better off if each and everyone of us tried to live our individual lives in such a was as to not make a mess that others either trip over or have to clean up. Beyond that its up to each one to make their own way.